Voranc - Management 3.0 Licensed Trainer is coming to Prague to deliver this interesting two days workshop. Management 3.0 is a workshop, a course, a couple of books, and a collection of concrete practices, to inspire managers and team members, who face the challenge of transforming their organizations to be more innovative, with a higher productivity. The Management 3.0 course aims at leaders/managers/knowledge workers who want to become Agile, and other stakeholders involved in leadership and management. The course typically draws team leaders, development managers, coaches, scrum masters, project managers, product owners, developers, testers and top-level management. Agile management is a new approach to leadership and governance of creative teams and people. 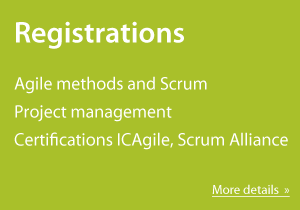 You will learn about the contribution of the manager and team leader in Agile organisations. Complexity thinking is a cornerstone of an Agile mindset. You will learn the principles behind complexity theory, about the difference between complex and complicated and how to apply systems thinking to your organisation. Intrinsic motivation is the reason people get out of bed in the morning. People are the vital heart of an organisation and management must aim not destroy their motivation. You will learn about extrinsic vs. intrinsic motivation and common techniques for great one-on-one meetings, personal assessments, twelve very important questions, and 360 degree evaluations. Self-organisation is at the core of high performing teams. Self-organisation requires empowerment, authorisation, and trust. You will learn how to make self-organization work, how to distribute authorisation, the challenges of empowerment and how to strengthen relationships. We’ll cover techniques for distributed control, such as the seven levels of delegation, and authority boards. Goal setting is important to give people a clear purpose. You will learn when to manage and when to lead, how to use different criteria to create goals, about challenges with management by objectives, and how to protect people and the organisation from negative side effects. Competence development is key when it comes to doing a good job. Teams are only able to achieve their goals if team members have the required skills. As a manager you need to contribute to people’s development. You will learn how and when to apply the seven approaches of competence development, how to measure progress in a complex system, the effect of sub-optimization, and several tips for useful metrics. Organisational structures significantly impact on how an organisation works and communicates. You will learn how to balance specialisation and generalisation, how to choose between functional and cross-functional teams and about informal leadership and widening job titles. You will also learn about treating teams as value units in a wider value network. Change management is often poorly understood, but critical to the success of an agile company. People, teams, and organisations need to continuously improve and managers and leaders must act as change agents within the complex social systems around them. You will learn about the four facets of change management, the system, individuals, interactions, and boundaries of the system. The duration of the workshop is two days. It will be in Prague on November 5-6, 2015 in English.